JGU accepts the SAT, ACT, and LSAT-India for all Undergraduate Programmes excepting 5-Year Law [Only LSAT-India] and B. Arch [NATA and JEE]. BBA and IMB also accept the UGAT Examination. The scores will be accepted for seeking Admission into following undergraduate programme at JGU for academic year 2018-19. 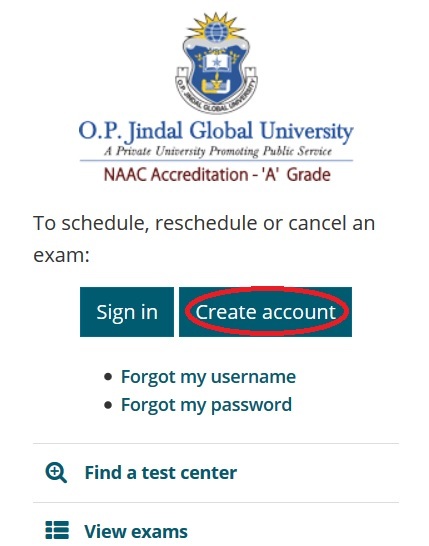 Prior to scheduling the date, time slot and test centre location for JSAT, candidates are advised to complete and submit their online programme application form through the link of respective school that they wish to apply for, at www.jgu.edu.in. Candidates will be required to enter their JGU application number while registering for JSAT exam. JSAT scores will be considered only if candidates have submitted the programme application form. Just follow the below steps to register for JSAT 2019. Step 3 : Candidates will be able to select the date, time slot and test centre of choice based on the availability of seats and take the Online Test. Candidates are allowed to make multiple attempts at JSAT during the year’s testing period if they wish to. The best scores out of all the attempts will be considered. Candidates are required to pay for each attempt and can schedule the retake test with a gap of four or more days from their previous attempt during the testing window (subject to real time availability). The JSAT is a Multiple-Choice Questions (MCQ) test. It has 120 questions and needs to be completed in 120 minutes. There are no negative marks for wrong answers. The test will be ready after 5 January 2019. Each programme gives different weightages to different sections a final total. Applicants must receive a 55% weighted score to be considered for admission. If an applicant is unable to take the JSAT before the last date or misses their Faculty Interview without rescheduling, they may be re-considered in the next round of applications by applying to reactivate their application for 500 Rs. O. P. Jindal Global University (JGU) is a non-profit global university established by the Government of Haryana and recognized by the University Grants Commissions (UGC). JGU was established as a philanthropic initiative of its Founding Chancellor, Mr. Naveen Jindal in memory of his father, Mr. O.P. Jindal. JGU has been awarded the highest grade ‘A’ by the National Accreditation & Assessment Council (NAAC).